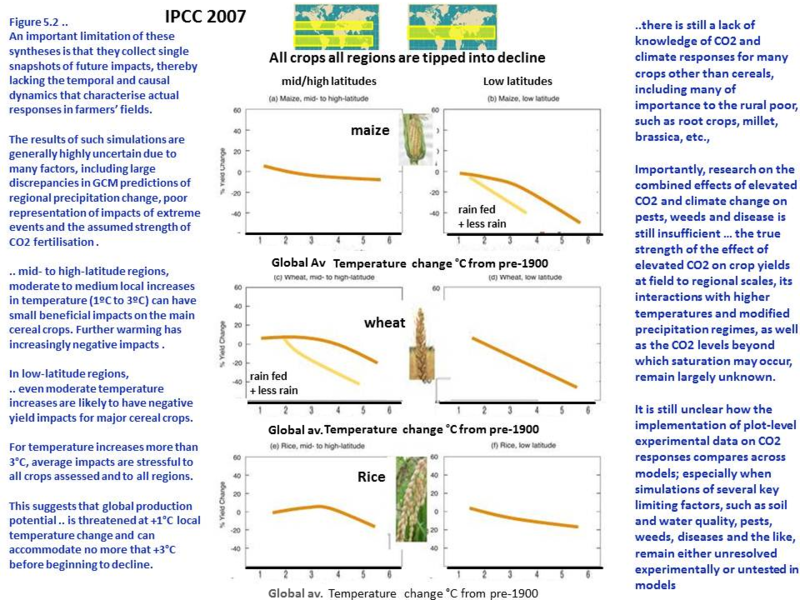 The climate crop computer models that are still in an early stage of development with the many very important adverse impacts are not being accounted for in the models. The models are run using data are that assumes the current crop climate relationships will continue on changed, in such aspects. The leading example of this is that the increase in extreme weather events are not incorporated in the computer models. Extreme weather events are the most damaging impacts of global warming and climate change. The models in general do not account for the inevitable increase in sudden spikes in temperature, heat waves, droughts, severe storms, torrential rains and floods. Global climate change is more accurately described as global climate change and variability, or as Dr. John Holdren suggests climate disruption. Clearly increasing climate variability is disastrous for the practice of agriculture that relies on the predictability of seasonal weather to tor conditions. As many of the adverse affects that are not modelled or incompletely modelled the assessment is by the scientists must be assumed to be large under estimates. 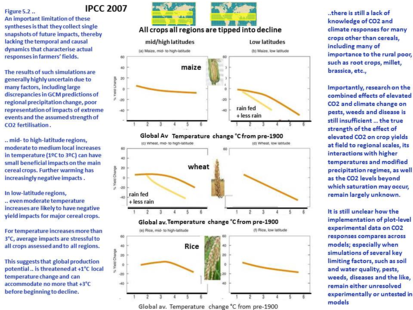 In its presentation of the crop climate model results the IPCC says this. The results of such simulations are generally highly uncertain due to many factors, including large discrepancies in GCM predictions of regional precipitation change, poor representation of impacts of extreme events and the assumed strength of CO2 fertilisation. ​An important limitation of these syntheses (aggregations of model results) is that they collect single snapshots of future impacts, thereby lacking the temporal and causal dynamics that characterise actual responses in farmers’ fields. Currently, the direct use of climate model output within crop prediction systems is limited. The dependence of yields on the seasonal mean climate is well documented across a range of crops, and their response functions are now known to be far from linear. Increasingly, emergent is the importance of the sensitivity of crops to drought and periods of heat stress at particular stages of development. This suggests that there are thresholds above which crops become highly vulnerable to climate and weather (Challinor et al. 2005; Porter & Semenov 2005). More controversially, the response of crops to changes in atmospheric composition has produced conflicting evidence, with the benefits of carbon dioxide (CO2) fertilization being less than previously thought and potentially being counteracted by the damaging effects of increases in surface ozone (Long et al. 2005). There is little account of the effects of sub-seasonal variability in climate in these studies and the impacts of weather thresholds are entirely absent; both factors are likely to reduce crop yields further. The distribution of rainfall through the growing seasonal is critical for many crops, particularly in the semi-arid Tropics. These variations in rainfall, generally associated with dominant weather patterns, are currently poorly simulated in climate prediction models. Many uncertainties in our knowledge and understanding of the interface between atmospheric composition and crops still exist. Until recently, research indicated that the positive impacts of CO2 enrichment would most likely compensate for the negative impacts of rising mean temperatures (which shorten the growing season of most annual crops, and so reduce yields of current varieties). These conclusions were largely based on studies of crops grown in field chambers or in controlled environments that showed that the yield of C3 crops (such as rice, soybean and wheat) increased by 24–43% with doubled CO2. However, a new analysis based on a small number of studies of crops grown in near-field conditions suggest that the benefits of CO2 enrichment may be less than this, in the range of 8–15% (Long et al. 2005). The decline in air quality with increased levels of surface ozone could have serious detrimental effects on crop growth. C3 crops are particularly sensitive; initial estimates suggest that the loss of yield is currently ca 5%, rising to potentially ca 30% in 2050 (Long et al. 2005), but further studies are needed to confirm these estimates. Countries such as China, where ozone levels are predicted to rise dramatically, may be seriously affected (Erda et al. 2005). Overall, the impacts of changes in atmospheric composition may be more damaging than previously estimated, and more research is urgently needed so that these effects can be included in crop prediction models. In particular, there are, to date, no field experiments quantifying the impacts of increased CO2 and ozone levels in the tropics, where most of the world's food is produced. The adaptation of food systems to climate change will in turn also influence atmospheric composition through emissions of methane from, for example, rice paddies, and nitrous oxide from the use of synthetic fertilizers. Since these are important greenhouse gases, it is disturbing that the agricultural emissions of methane and nitrous oxide are projected to rise by up to 60% by 2030 (see Gregory et al. 2005). As well as being a potent greenhouse gas, nitrous oxide is also involved in stratospheric ozone depletion. 'The expected impacts ..(ie from the models) are useful as a measure of the likely direction and magnitude of average yield changes, but fall short of a complete risk analysis which would, for instance, estimate the chance of exceeding critical thresholds. The increase in the lower atmosphere energy from global warming will drive the planet's hydrological cycle harder. This will of course have major impacts on crop productivity, but the climate models being a used for projecting changes in the hydrological cycle are extremely inadequate. Uncertainties in projected changes in the hydrological system arise from internal variability of the climate system, uncertainty in future greenhouse gas and aerosol emissions, the translation of these emissions into climate change by global climate models, and hydrological model uncertainty. Further sources of uncertainty in hydrological projections arise from the structure of current climate models. Some examples of processes that are, at best, only simply represented in climate models... Current models generally exclude some feedbacks from vegetation change to climate change. Most, although not all, of the simulations used for deriving climate projections also exclude anthropogenic changes in land cover. The treatment of anthropogenic aerosol forcing is relatively simple in most climate models. While some models include a wide range of anthropogenic aerosol species, potentially important species, such as black carbon, are lacking from most of the simulations used for the AR4. More than half of the AR4 models also exclude the indirect effects of aerosols on clouds. The resolution of current climate models also limits the proper representation of tropical cyclones and heavy rainfall. Uncertainties arise from the incorporation of climate model results into freshwater studies for two reasons: the different spatial scales of global climate models and hydrological models, and biases in the long-term mean precipitation as computed by global climate models for the current climate. [...] Therefore, changes in inter annual or day-to-day variability of climate parameters are not taken into account in most hydrological impact studies. This leads to an underestimation of future floods, droughts and irrigation water requirements. In terms of modelling, calls by the TAR (2001 IPCC third assessment report) to enhance crop model inter-comparison studies have remained unheeded; in fact, such activity has been performed with much less frequency after the TAR than before. It is important that uncertainties related to crop-model simulations of key processes, including their spatial-temporal resolution, be better evaluated, as findings of integrated studies will remain dependent upon the particular crop model used. It is still unclear how the implementation of plot-level experimental data on CO2 responses compares across models; especially when simulations of several key limiting factors, such as soil and water quality, pests, weeds, diseases and the like, remain either unresolved experimentally or untested in models (Tubiello and Ewert, 2002). Finally, the TAR concluded that the economic, trade and technological assumptions used in many of the integrated assessment models to project food security under climate change were poorly tested against observed data. This remains the situation today. 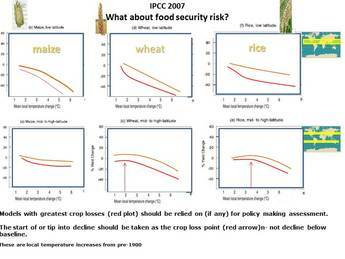 The reason for including this section on climate crop models is that while the assessments of global warming and climate change impacts on food security relies on quantitative projections from the models, in reality the models produce results that are large under estimates of the actual total impacts to expect on food production in the real world. This is because global warming and climate change have multiple adverse impacts on crops, many of which are not captured by the climate crop computer models. The existing literature identifies several prominent sources of uncertainty, including those related to the magnitude of local warming per degree global temperature increase, the sensitivity of crop yields to temperature, the CO2 levels corresponding to each temperature level (see section 3.2), and the magnitude of CO2 fertilization. In addition, although the studies summarized in Figure 5.1 consider several of the main processes that determine yield response to weather, several other processes have not been adequately quantified. Moreover, most crop modelling studies have not considered changes in sustained droughts, which are likely to increase in many regions (Wang, 2005; Sheffield and Wood, 2008), or potential changes in year-to-year variability of yields. The net effect of these and other factors remains an elusive goal, but these are likely to push yields in a negative direction. The Agricultural Model Intercoparison and Improvement Project (AgMIP)The goals of AgMIP are to improve substantially the characterization of world food security due to climate change and to enhance adaptation capacity in both developing and developed countries. Research July 2013 on wheat. It has been found that with increasing climate change crop models for wheat give increasingly different results. 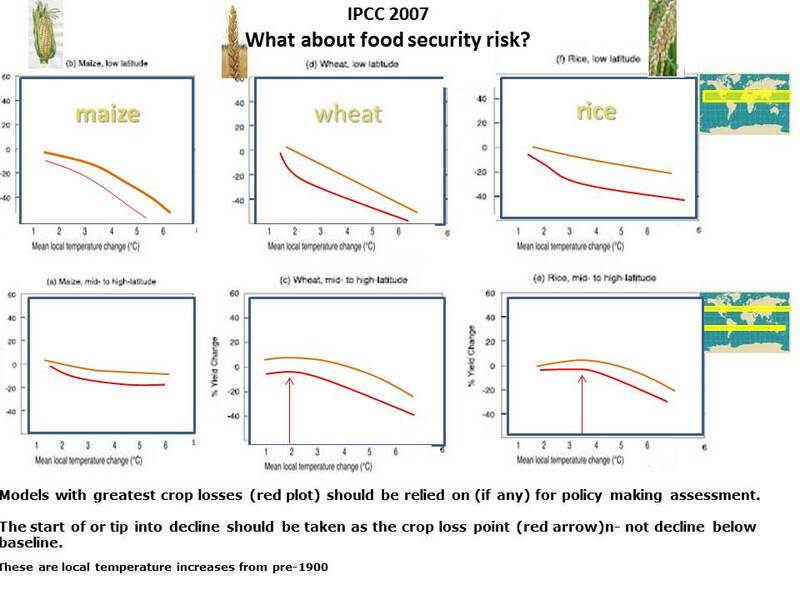 Food security assessment should rely on the worst outcome crop models , but this is not the case because the IPCC takes an indiscriminate rough mean from all the model results. IPCC AR5 2013-2014 WG2 7.3.1 The magnitude of fertilizing effect of CO2 at the elevated concentrations as a result of high temperature, increased variability and several limiting factors such as soil nutrients, pests and weeds is not well understood hence a source of uncertainty (Soussana et al 2010). Also,most of the current generation crop models do not include all the effects of climate change, such as pest and disease effects, damaging effect of high surface ozone concentrations, possible decrease of glacial water supply, competing use of water by industrial sector and households (Pia0 et al. 2010), role of extreme events and interaction between biotic and abiotic factors (Soussana, et al. 2010). The uncertain projections of rainfall by different climate models further increase the uncertainty of future crop yield changes (Buytaert et al. 2010). a limited number of genotypes.